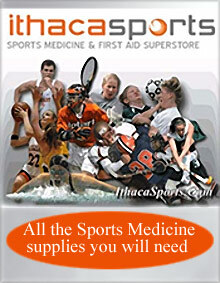 With the IthacaSports.com coupon code, the best sports medicine supplies ranging from braces to sports tape, guards, ice packs, bandages, first aid and more sports health products can always be on hand. Enter the Promotional Code - catalog10 - at checkout on the IthacaSports.com website. Sports medicine supplies - Stock up on all of the essential sports medicine supplies that every winning coach needs on hand in their locker room. Fill your medicine cabinets with a variety of sports medicine products that are carefully chosen and guaranteed to suit your players' needs, from topical pain relief products to general first aid, sports tape, sports guards and braces, blister care, Bio Freeze, massage aids and so much more. Sports guards - IthacaSports.com is owned and operated by a Certified Athletic Trainer who knows exactly what sports health products an athlete needs whether they're prepping for the 2nd half of a tied football game or sparring in the boxing ring. Maintain that killer smile and profile while avoiding major injury with a heavy-duty sport guard for the mouth, sports tape and nose guards that will keep teeth and nasal bones safe and in their right place. Sports braces & supports - Besides featuring an arsenal of sports medicine supplies for post game battle scars and boo-boos, Ithaca Sports helps keep every body part supported while avoiding further afflictions with a wide selection of sports braces, supports and shields that are built to protect the ankles, knees, wrists, elbows, shoulders, backs, necks, ribs, shins, Achilles tendons, arches, heels, toes, eyes and every body part that may be at risk. Sports first aid - Ensure that your first aid kit is properly equipped with an assortment of sports medical supplies that will keep you prepared for any sports related emergency. Choose from sports tape, athletic bandages and dressings, antiseptics and ointments, splints, gauze pads, sports medicine products for burn care and pre-packaged First Aid kits and bags that are already furnished with all of your sports health basics, a must-have for any sports team. From sports medicine products for rehabilitation to sports guards and shields to protect from future injuries, IthacaSports.com makes a commitment to stocking your locker rooms with the right sports medicine supplies for any kind of sports related ailment or injury. Plus, if they don't have it in stock, they will order it for you -- exhibiting unbeatable customer service and true sportsmanlike behavior.